Remember that 1967 Beatles song – Strawberry Fields Forever? 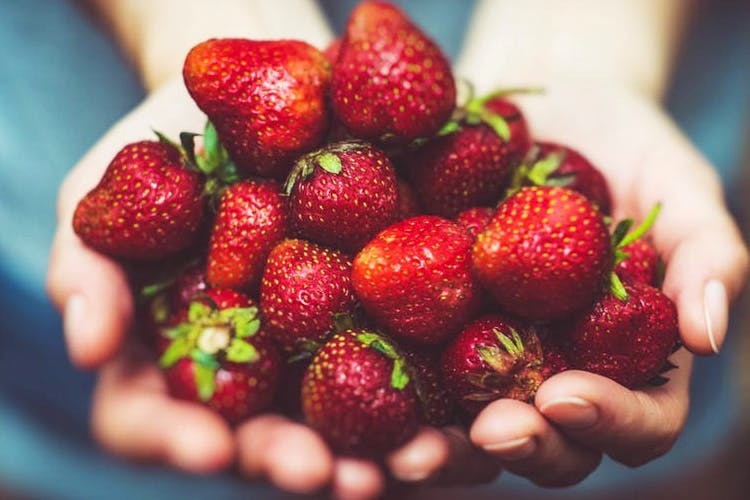 How about we tell you about a weekend getaway amidst endless strawberry farms and plantations, with your close buds, picking and tasting farm-fresh strawberries, just two-hours away from Pune? The Mahabaleshwar strawberry is grown in the hilly slopes of Mahabaleshwar-Panchgani belt in Western Maharashtra. The production accounts for about 85% of the total strawberry produced in the country. What’s awesome is that they let you taste the yummy and fresh berries grown here! The farms and the plantations are well-maintained. The owners are quite friendly and let you enter their farm, spend time, pick and taste the juicy fruit and buy if you want to. Don’t forget to stop by the Bhilare Farms on the Panchgani-Mahabaleshwar road. Spend couple of hours in the garden. The owner and his team will walk you through the beautiful plantation of strawberry, raspberry , mulberry and blueberry. You can pluck and eat the fruits, handpick and also buy them in small quantities. After a day of strawberry picking and tasting, drop by at the Rustam Strawberry Inn. It’s a quaint Parsi restaurant in Panchgani serving lip-smacking delicacies like the patra fish, chicken sali and caramel custard. Also, their homegrown strawberry jam is heavenly! Before you leave Panchgani, end your trip with some shopping at the Mahabaleshwar Market and a walk around the Krishna Ghat at Menawali.